This is my last official post on Gattegno Textbook 1 which you can get free here. I'm sure we will be back and forth, but my 2 year series has come to a close with the introduction of zero. I'll be doing a little bit of clean up at the end of the post. Since I had introduced zero to P. ages ago, we didn't do the activities in the book. For this portion of the book, we did some number study work, it just happens to be a very short study. However, the concept of zero provides ample material for exploration, which we continue to do. If we write 7 + _____ = 10, we know what we need is a 3. If we write ____ + 4 = 10, we know what we need is a 6. But if we write 10 + _______ = 10, we know we don't need anything. Therefore, we will write 0 there to show nothing. Thus we get 10 + 0 = 10, which we read ten plus zero equals ten. The student should practice writing and reading addition equations with zero as the second term. The student should also practice writing and reading zero as the first term in the equation. If we write _____ + 10 = 10 we know we don't need anything. So we can also fill this space with zero. We will write that 0 + 10 = 10, which we read zero plus ten equals 10. Then practice writing equations with zero as the first term. That's it. That is all there is to the introduction of zero. I wasn't quite done with zero yet. We've played around a lot with the concept zero since P. was just a toddler. This video is from when P. had just turned 4. 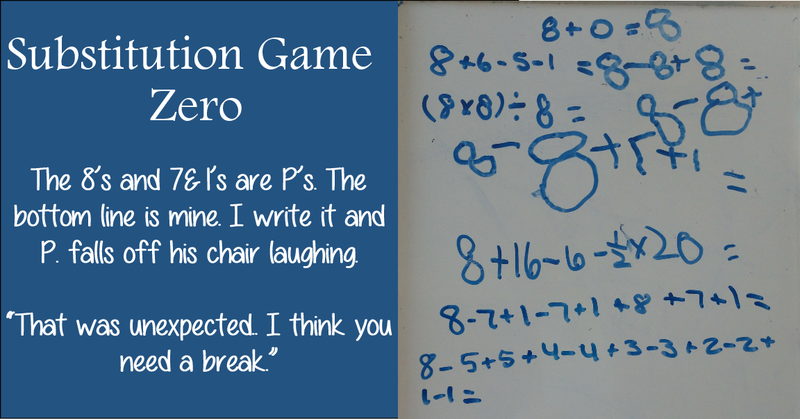 We were working on negative numbers, which P. loves - not nearly as much as he loves his current obsession - subtraction. He hasn't yet figured out that they it's basically the same thing. He goes in phases, it used to be fractions. I introduced negative numbers using the concept of holes and piles. As you can see, we went to the beach and dug holes and created piles. P. calls zero the "Big Nuthin". This is where P. got the idea that you can add and subtract the same amount from a number and it doesn't change anything because it's just a "Big Nuthin". We played holes and piles with play-dough, cheese slices, and fruit leather. You can use tiny cookie cutters to cut out shapes and put them back. This was an excellent activity for us. What we learned is that to get to a pile from a hole, you have to fill the hole and then make a pile. There are two steps to get from a single hole to a single pile. If you just put sand in a hole to fill it, all you've got is a nothing. You know those times when you wish you could have caught something on video, our multiplying and dividing with zero lesson was one of those times. I asked P. to show me, with blocks, eight nothings. He looked at me, picked up a rod, looked at me, and thought and then looked and me and said, "I don't know how." So I said, "Maybe it would be easier to show me no eights with the rods." He looks at his white board, then the rods and then at me and then says, "Mom, it's nothing. I can't make that." "Let's try division," I say. "How many zeros in 8?" I got a similar response. He finally says, "Dividing by nothing doesn't make sense. Is that what you want from me?" He is irritated by this point not sure if there is an answer or not. It didn't help that I was laughing. We ended up having a good discussion on zero and we gave each other piles and piles of no money. We ate zero scoops of ice cream x 3, enough for our whole family to have nothing. I discussed the substitution game in depth here. The game has very simple rules, unless you want to add lots of rules, and a nearly endless number of variations and constraints so that the game is never the same twice; the teacher has the ability to focus on certain awareness and skills she wants the student to have. 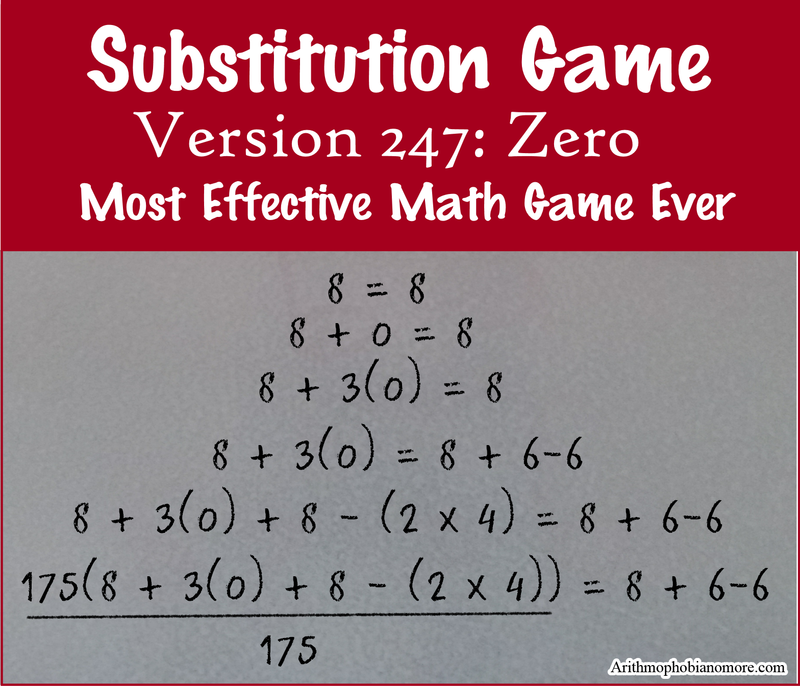 We played several versions of substitution game zero. P. was in a silly mood the first time we played and we ended up with this image, which I posted in the FB group. We also tried to shoot a video of this whole thing. We both ended up laughing so hard we quit for the day. One of P's favorite math tricks is to add and subtract the same number. He subtracted 8 but added 7 + 1. He subtracted two 7 +1's and added a 7 +1 and an 8. I wanted to find out how much he really understood about what he was doing, so we did played again. Different day, Substitution Game Zero. Instead of 8 + 0 = 8 as our starting equation I used 8 = 8. Sometimes, when we play the substitution game, the goal is to transform the 8. In this game, our goal was to leave the 8. The following was taken from that game. If I want the game spaced over several days, I will tape freezer paper to the wall, and we can work on it as we walk by, or while we are cleaning the kitchen. It takes just a couple minutes to add a new line. You'll notice above P's use of 6 - 6 and 8 - (2 x 4). I multiplied and divided by 175. There was more to this particular game but we stopped here to talk math. P. wasn't sure about multiplying and dividing like this. He called foul. Sometimes, he ignores what I do, he probably assumes I know what I am talking about. But he wasn't buying this. I asked what we are doing when we add 8 and take away 8. He didn't really get what I was asking; he just stared at me with a blank expression on his face. I gave him a brown rod: What did I just do? P: Gave me a brown rod. I took the rod away: Now what did I do? I wrote 8 on a dry erase board: What did I do? I erased the 8: Now what? I asked for his sneaker and tied his shoe: What did I do? I untied the shoe: Now what? Me: We can talk about adding 8 and subtracting 8 as doing and undoing. There was a long pause. I just sat there. P: But, if we multiply and divide by the same number we get 1 and not zero. Three divided three is not zero. The conversation continued and we multiplied 3 x 3 and divided it all by 3. We multiplied 8 x 3 and divided by 3. He very accurately noted that if I multiply (3 - 3) x 8 I'll get zero. Multiplying and dividing by 3 is not the same as adding and subtracting zero. There was a tentative agreement we could use 1 in the game if we agree that the purpose is to not change the 8, but it definitely isn't zero. P. wasn't exactly happy with this solution. He felt like I was cheating and didn't follow the original rules. I wasn't interested in the rules of this game, but rather that he start thinking about what we can do to a number that won't changing it - the effect is nothing. I wanted him to become aware of the doing and undoing of operations. I am absolutely willing to use his sense of truth and "fair vs unfair" and a game to think about big math ideas. There are a few sections in chapter 6 that I didn't cover such as odd/even numbers, simple division and multiplication. I cover all those under number study - we keep track of that information on our Table of Factors. There is a lot more that can be done with number studies and numbers inside 20. I heartily recommend Play Discover Learn's Journal Sheets. That set contains 156 journaling pages. Many of the pages were designed to be used over and over again. We use these all the time. You can expect some posts from me in the near future on her fantastic resources. I will not be blogging my way through book 2. We aren't exactly moving on and we aren't exactly staying where we are. Having completed book 1, I don't feel like the other books need to be completed in order or that I have to be done with book 1. We can be working through the books at the same time. Book 7 covers some of the extended activities we discovered while working on chapter 3. 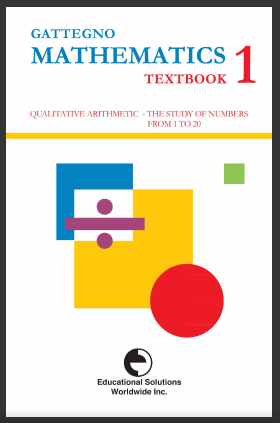 Our Number Studies and Table of Factors covers a great deal of the material found in book 5. I already introduced squares, cubes and roots a long ago. We don't have a complete understanding, but it's not new material. There is nothing to stop us from playing around with geometry at this point either. So we might as well do some work in book six also. Plus, I will be pulling activities from the Handbook of Activities and Madeleine Goutard's work. If this interests you, you can find all my posts on Gattegno Textbook 1 here. If you would like to join a bunch of folks using base ten blocks, of all kinds, to teach math, you can join us here.